Strangely, I have seen no celebrations of the 1948 National Assistance Act which like the NHS was created 70 years ago. Yet this important piece of legislation was a key component of the post war reforms and creation of the Welfare State following the second world war. It worries me that we have no problem coming together across the country to celebrate the NHS but fail to acknowledge that it was only one part of a postwar settlement that aspired to create a fairer and more equal society through the creation of the welfare state. Aiming to tackle Beveridge’s 5 giant problems – Want, Disease, Squalor, Ignorance and Idleness. Anyone in the NHS or wider public health who says that we need to focus more on ‘prevention’, get ‘upstream’ or recognise the ‘social determinants of health’ needs to take the time to understand and champion the role social welfare legislation plays – it is at least as significant to peoples health and wellbeing as the NHS. As Wikipedia notes the 1948 National Assistance Act followed on from the 1946 National Insurance Act which required all people of working age to pay a weekly contribution in return for access to a wide range of benefits, including Orphans Allowance, Death Grants, Unemployment Benefit, Widows Benefits, Sickness Benefit and Retirement Benefit. The Act formally abolished the Poor Law and and established a social safety net for those who did not pay National insurance contributions (such as the homeless, the physically disabled, and unmarried mothers) and were therefore left uncovered by the National Insurance Act 1946 and the National Insurance (Industrial Injuries) Act 1946. It provided help to elderly Britons who required supplementary benefits to make a subsistence living, and obliged local authorities to provide suitable accommodation for those who through infirmity, age, or any other reason were in need of care and attention not otherwise available. The legislation also empowered local authorities to grant financial aid to organisations of volunteers concerned with the provision of recreational facilities or meals. 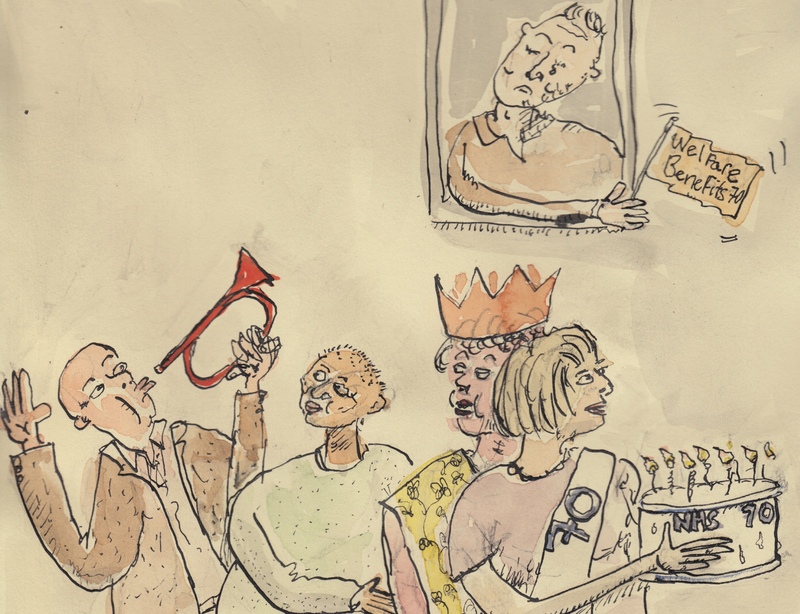 There were no celebrations in cathedrals to commemorate its anniversary – despite the significant role our benefits systems plays in keeping people well. There were no commemorations of the staff who work in Job Centres and elsewhere who try their best to make an increasingly unjust system work for the benefit of people who needs its support. The original ambition of Beveridge and the post war government was that access to this system should not be means tested. If you have never seen them there are two great Central Office of Information films about the establishment of the NHS and the Welfare Benefit system that were made at the time to explain both of these to the general public they are worth a look! I find ironic the people who point all this out actually never themselves set up any means of celebration / recognition events ! Thanks for reading the blog Toby – I suppose my writing the blog is my personal attempt to celebrate this. In fact it was only when researching the blog that I discovered that the Poor Law was abolished in 1948! A good piece Mark, mirrors my thoughts on the celebrations. The NHS is undoubtedly a great thing but the emphasis placed on it makes it feel that as a society we don’t want to discuss the underlying causes of poor health. We accept the fact that communities live side by side with an 8 to 10 year differential in life expectancy and poorer life-long health. The other milestones you mention, with the NHS, were critical in changing life chances but further change seems no longer to be on the agenda. In addition, the veneration of the purpose and objectives of the NHS appear to being subsumed by veneration for the institutions of the NHS, preventing us from considering how we might achieve better outcomes with alternatives to the current set up. There are plenty of examples across the world. Finally, as with the rest of the public sector, people are not treated as having complex life’s and needs but defined according to the specialisms that the professionals like to compartmentalise their work into. Hi Mark, this is an excellent and much needed article, that should remind all of us that the NHS is one initiative, amongst others, that helped improve the lives and experiences of ALL citizens in the UK. I was wondering whether you would allow me to bookmark it in the next edition of Minding the Gap?